It’s happening again today. I’m busy. There’s a lot on my plate, I’m feeling a bit overwhelmed, and under a lot of pressure to get things done NOW. Checking things off my to-do list immediately is not scratching through them quickly enough. I’ve felt overly anxious about getting things done a couple of other days in the past few weeks and now that the feeling is back this morning, I am convinced I know where it’s coming from: the execution of Donald Newbury tonight at 6 p.m. here in Huntsville, TX. That’s why I am extra fidgety and agitated and urgent today. I know death is coming again in a particularly nasty way. I know there’s another condemned person going through the surreal deadline of life’s final hours. While Donald Newbury ticks off the final hours, I feel like I too, am on a countdown. My countdown ends a little before his. 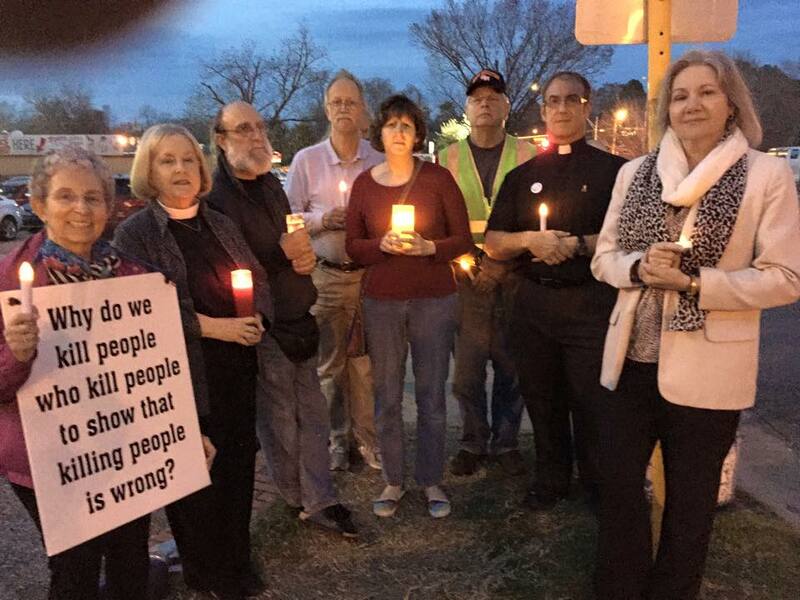 During the hour or so before he is executed I will stand vigil with local abolitionists, including members of Thoreau Woods Unitarian Universalist Church, the congregation I serve here in Huntsville. I’ll be holding a candle and thinking about complete insanity of it all. At some point I am sure I will allow myself to feel a deep sadness. Don’t mistake my emotion. I will mourn for Donald Newbury, but much more so for myself, for all of us. Donald Newbury is a multiple violent offender. His last crime was escaping from prison with six others, robbing a sporting goods store and then killing a police officer. Two of his six companions received death sentences and one committed suicide. He did not lead an upstanding life. I still don’t believe he should be executed. No one should be executed. By just about any rational measure the death penalty is supremely flawed. The only arguments for it is political and ideological. The death penalty is not tough on crime and revenge is an extremely poor justification for such a barbaric practice. It’s use stops us from moving away from punishment and toward restoration. It’s use tends to become arbitrary. It is a punishment only for the poor. Innocent people are executed. Over 20 people on death row have been proven innocent by DNA evidence. My agitation and anxiety today comes from knowing all this as well as the knowledge my time is winding down to an appointment spending the late afternoon and early evening confronted once again with the ugly, demented side of our culture and our society’s insatiable need for violence. Executions are a sign of a massive failure. We still let a need for revenge and punishment rule our law. An eye for an eye is not justice. As Gandhi said, an eye for an eye only leaves us all blind. The ultimate justice question is not what a convicted criminal deserves as punishment, but what do we as a people, as a society deserve? Justice, after all, is giving each what they deserve and that means all of us involved: the criminal, the victim, the victim’s loved ones, the criminal’s loved ones, the society at large. I don’t know any death penalty opponent who lacks compassion for the loved ones of the victims of violent crime. My heart breaks for them. That type of loss is unimaginable. Executing an offender, however, does not end the loss and pain of a victim’s family, but rather may prolong it. We deserve a less violent society and the use of the death penalty makes us a more violent, not a less violent people. After all a prisoner, in custody in a small cell in a highly secure facility is not going commit more violence. The execution of the prisoner, however, continues to teach the lesson that at some level, at some point, killing each other is acceptable. As long as the executed has done something wrong enough, vile enough, horrible enough. When we kill we become killers (and when the state kills, all of us who are citizens of the state are the killers). When we act peacefully we become peaceful. It’s how virtues and vices work. You do what you are and you are what you do. Tonight’s candlelight vigil will probably have some extra tension as the murderer of a policeman is being executed. It is no disrespect to police officers to believe that their lives are not worth any more (or any less) than anyone else’s. The entire point of my opposition to the death penalty is that all life is too important to use killing as punishment. I want us, as a society, as a people, to find a way past the injustice, inequality, and violence of capital punishment towards a more compassionate, peaceful, and restorative way to handle the most terrible violent criminal behavior. The only way to end cycles of violence is for someone or some group to stop the retaliation. I pray we can find that way. Ultimately we must choose that way forward or choose not to go forward. So tonight I will stand on the side of love and hold my candle -and my tongue. So this morning I sit and say my piece. And sometime today I will cry – for a murdered police officer and the officer’s family and Donald Newbury and his family… and all of us.